We would think it a high honor to receive an invitation to visit the President of the United States or the Queen of England, but a far greater privilege beckons you and me; “Having therefore, brethren, boldness to enter into the holiest by the blood of Jesus, by a new and living way, which he hath consecrated for us, through the veil, that is to say, his flesh; and having an high priest over the house of God; let us draw near with a true heart in full assurance of faith” (Hebrews 10:19-22). We may “enter into the holiest” through the “new and living way” that Jesus has opened for us. In the ancient tabernacle no one but a priest could enter the Holy Place, and only the high priest could appear in the Most Holy Place. But Hebrews 10:19-22 invites all of us to go in. How can what was possible to only a few be accessible now to every child of God? “A new living way” has been opened for us, and we can enter by Jesus’ blood. Looking into the court, we see blood on the horns of the brazen altar. In the Holy Place we see blood on the golden horns of the altar of incense. Within the second veil we behold the sprinkled blood on the mercy seat. Jesus’ blood prepares the way at every step. This gives us hope, for the sinner can have reunion with God only as his sins are pardoned and finally blotted out. The mercy of God is infinite, but so is His justice. And justice cannot accept Christ’s sacrifice as atonement for our transgressions unless Jesus guarantees first to forgive our sins and second to blot them out. Our acceptance at the throne depends on His fulfillment of that promise. But Christ can do that only as we daily choose Him. His blood must cover our past sins and His spirit must reveal further changes in our lives so that at last we can join Him in the inner circle. Those He ransoms from this earth will enjoy a closer communion with God than even the angels who have never sinner. Hebrews 10:19 says, “Having therefore, brethren, boldness to enter into the holiest by the blood of Jesus.” Rather than the boldness of presumption, we have, instead, the assurance of faith as we present Christ’s blood and the incense of His merits. His robe of righteousness can cover us if we so choose. We enter by the new and living way which He has opened for us “through the veil, that is to say, his flesh” (verse 20). You remember that when Jesus died on the cross, an unseen hand tore the inner veil of the temple in Jerusalem from top to bottom (see Matthew 27:51). Thus God announced the transition from the earthly to the heavenly temple. However, there was more to the message of the torn curtain. No longer was a veil needed to stand between God and man, for Jesus had opened up a new and living way. Notice the expression, “through the veil, that is to say, his flesh.” Jesus came as a human being not only to tell us how to live but to show us how to live. As man He obeyed the commandments that He Himself had written on the stone. “What the law could not do, in that it was weak through the flesh, God sending his own Son in the likeness of sinful flesh, and for sin, condemned sin in the flesh: that the righteousness of the law might be fulfilled in us, who walk not after the flesh, but after the spirit” (Romans 8:3,4). Whenever Satan tempted Jesus, He answered, “No! No!” Instead of consulting His feelings He ordered His life by the Word. “In all points tempted like as we are” (Hebrews 4:15), He developed a character that completely revealed His Father’s will, and Gethsemane and Calvary provided the crowning demonstration of obedience even unto death. The Savior promises the Christians in Laodicea, “To him that overcometh will I grant to sit with me in my throne” (Revelation 3:21). As the judgment proceeds in the Most Holy Place, Christ sends this special invitation to join with Him in the throne room. Some day soon we shall enter the New Jerusalem and walk those golden streets. 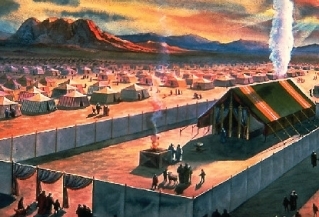 When we visit the temple where the plan of salvation of unfolded, we expect to see the candlestick, the table, the altar, and the ark with the tables of stones. Then Jesus will take your hand and seat you on the throne with Him. As I think about it I am sure it is not so much that He wants us to reign as that He wants us to be with Him. I’m a father, and I know it means a lot to a father’s heart to have somebody sitting on his knee; this helps me understand a little of how God feels. He wants me with Him, up close, sitting right with Him on His throne. This is the fellowship that He has offered to us through the sanctuary. I propose to give Him what He wants. What do you say? When the prodigal son in the pigpen decided to return home, he had no idea of the welcome awaiting him. He reckoned that he could offer his services as a hired hand, but when the father saw him, he ran to meet him, threw his own robe around him, ordered a banquet, and accepted him as an honored son. Do you know why? Because there was love in the father’s heart and repentance in the son’s heart. The son left a lot of things in the far country. Do you think he brought home with him the wine and the harlots? Do you imagine he brought the music of Sodom, its literature and its pictures? A spirit of permissiveness pervading the world has crept into the church. Everyone must be made to feel accepted, to feel at home. Such a view comes from Babylon, not from the heavenly sanctuary. The Lord has no message of comfort for the rebel. The sword of the Spirit newly edged with power and bathed in the lightnings of heaven must cut its way through unbelief. As the sinner approaches the cross, he feels pained by sinfulness. He weeps as he beholds the uplifted Savior, dying for his transgressions. Only as he recognizes that his sins killed Jesus can the Lord comfort him with forgiveness and acceptance. Yes, the prodigal son came home with confession upon his lips: “Father, I have sinned against heaven, and in thy sight, and am no more worthy to be called thy son” (Luke 15:21). But the father didn’t even give him a chance to ask for a servant’s job. Once he had repented, there was no question about acceptance, reinstatement. Although God’s justice cannot accept the smallest sin if someone persists in hanging on to it, His mercy has found a way to remove the biggest sin if that person will give it up. It is that simple. Note the words, “We must by faith enter within the veil.” What does this mean? Speaking of God’s children after 1844, Ellen G. White wrote, “They are to understand His work and to follow Him by faith as He goes in before God. It is in this sense that they are said to go in” (ibid., 427). To enter within the veil, then, includes understanding His work and following Him by faith. While our feet walk the paths of earth our hearts can be with Jesus in the Most Holy Place. Doubtless you have had the experience of walking along a city street absorbed in thought and hardly noticing the passersby or the goods displayed in the store windows because your mind was somewhere else. In our thoughts we can be where we choose. Similarly, although I have never been in the heavenly sanctuary, I can picture it in my imagination. By faith I can see my great High Priest standing at the mercy seat for me. In my imagination I can view the myriads of angels assisting Him. I can see Moses, Enoch, and Elijah there. I can see the twenty-four elders around God’s throne. Yes, you and I can enter in our imaginations. Our thoughts can abide with Jesus at the mercy seat. The nearer astronauts get to the moon, the bigger it appears and the small the earth looks. Which way are you moving? Is the sanctuary in heaven becoming larger, more real? If it is, the things of this world are getting smaller and more dim- and you are becoming one with Him in heart and mind. “It would be well to spend a thoughtful hour each day reviewing the life of Christ from the manger to Calvary. We should take point by point and let the imagination [note that word imagination] vividly grasp each scene, especially the closing ones of His earthly life. By thus contemplating His teachings and sufferings, and the infinite sacrifice made by Him for the redemption of the race, we may strengthen our faith, quicken our love, and become more deeply imbued with the spirit which sustained our Savior. If we would be saved at last we must all learn the lesson of penitence and faith at the foot of the cross” (4T 374). Unless we can learn to contemplate and meditate, mere facts about the sanctuary will have no lasting influence in our lives. Ellen G. White has counseled us to study the Bible on our knees (see 5T 214). There is nothing wrong, of course, with reading the Scriptures while sitting in a comfortable chair. But there is something special about getting down by your chair or by your bed, opening your Bible, and letting Jesus speak to you through its pages. Then as you close your eyes you can picture in your imagination what you have just read and can talk to God about it. Thus day by day we can come to the sanctuary just as the penitent brought his lamb to the altar. By faith we can see Jesus, our Sacrificial Lamb, slain, and by faith we can follow Him as our High Priest while He presents the incense and sprinkles the blood of the atonement. All the way through, we are looking at Jesus, and the longer we do this, the more real He becomes. As we go about our work we can feel Christ’s companionship. We can visit with Him while we wash the dishes or cultivate the garden. As we drive to work, instead of allowing the traffic to irritate us, we can fellowship with the Unseen One. Busy at our work in the factory or the office, we can still enjoy His divine companionship. This is the new and living way which he has opened for us through the veil. If you learn the lesson of this chapter, you will eventually learn everything else you need to know. If you don’t learn it, nothing else you learn will have any permanent value. Everything hinges on your personal fellowship with Christ our Lamb and High Priest. This article is an excerpt from the book Ransom and Reunion Through the Sanctuary by W. D. Frazee and is available along with many of Pastor Frazee’s sermons at his website.